Yesterday’s post on the Corrick Collection demonstrated the great work done by a national institution, the National Film and Sound Archive of Australia. But great work can come from single scholars, and this second post on things Australian turns to the work of one of those generally referrred to as an ‘independent’ scholars or researchers. Independent scholars and institutions (archives, film institutes, universities etc) don’t always mix too happily, because each operates under different rules and pressures. But without the efforts of those such as John Barnes, Aldo Bernardini, Herbert Birett and Denis Gifford, our historiography of the silent cinema would be very much the poorer. The independent scholar – the good ones, that is – gets things done. And so we turn to Film History Notes, the plainly designed but richly informative website of Australian film historian Tony Martin-Jones. Bracingly describing his purpose as “getting to the truth after decades of unchecked nonsense”, Martin-Jones writes about the first motion pictures projected and produced in Australia and India. His mission is to overturn accepted truths about these first motion pictures, of which there are many. Early film history is full of ‘firsts’ of dubious veracity, and myths have been built up which were encouraged at a time when film history was less rigorous and often dominated by sentiment. He re-examines these through detailed use of newspaper accounts, catalogues, state archives, photographic sources and local knowledge, then by applying deductive logic, not trusting to any accepted truth (even if the process sometimes leads to the conclusion that those truths are – probably – correct). He then publishes all of his findings online, with clear descriptions, painstakingly compiled lists of dates, and extensive references. This is research information that is properly shared. So you can find out about the magician Carl Hertz and the first projected motion pictures in Australia, Lumière operator Marius Sestier and the first projected motion pictures in India (he was on his way to Australia), the meeting of Sestier and photographer H. Walter Barnett and their collaboration over the filming of the 1896 Melbourne Cup, and the 1897-1898 England-Australia test match films ostensibly filmed by Barnett (a long-held story that Martin-Jones vigorously challenges). He particularly goes to town over the Lumière film Patineur grotesque, which the National Film and Sound Archive recently announced as being the oldest surviving Australian film (see the Bioscope report from March 2010). 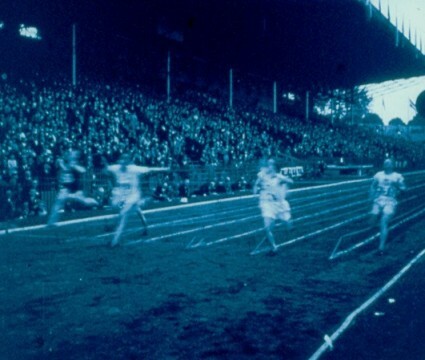 Martin-Jones challenges this, basing some of his argument on the length of shadows shown in the film (which he thinks was shot later than the Melbourne Cup films), instead asserting that it is the earliest surviving motion picture taken in Sydney, New South Wales, Australia – which has less of a ring to it. He has fun identifying the location (fun partly at the expense of the NFSA which had said that the location was Melbourne), and even has a go at identifying the skater. Institutions don’t always have the time to go into individual films with the passionate detail that Martin-Jones portrays, and in any case they are probably by definition homes of accepted truths. I have experience myself of working for a certain British film institution and having my identifcations of a very early film challenged by an independent scholar shocked that said institution could make such a blunder, writing detailed letters and papers about the misdeed (the said independent scholar turned out to be wrong, but that’s another story…) I sympathise with both sides, but I do admire an argument well made and good use of primary sources. And it is always good policy to challenge what you find, if you are going to call yourself a researcher. Whether the truths of history (film or otherwise) can be determined by the plain accumulation of chronological evidence is another matter. What does it matter who was ‘first’? What do such ‘firsts’ mean? Why do we still persist in considering film history through national eyes? It is difficult to avoid such stuff when considering those years when motion pictures were first produced and projected, but what does it actually tell us? We should always want to get our facts straight, but the real film history – which is the impact of film upon history – lies elsewhere. Thanks, Luke, for the interesting story. I can sympathize with the urge to dig deeply into a single film. So can I, Joe. I’ve spent years with some films, and often they’ve been so-called ‘first’ films. It’s because I’ve been so engrossed in such proto-films that I sometimes get a bit of a reaction against them. What on earth do they matter? But then ask me a question about one and just see if you can stop me talking for the next half-hour. I came across this article in the SMH which may be of interest as it states that in 1896 H W Barnett was asked (Presumably by Falk’s photostudio) to clarify his interests in the cinematograph and his relationship with Sestier and here he makes it clear his interests were focussed entirely on Melbourne but that they clearly had a business arrangement by this time. 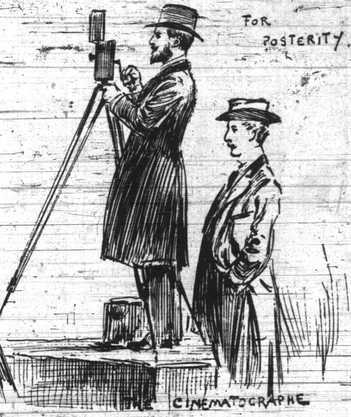 Mr. H. W. Barnett and Falk’s notifies in another column that ho is in no way connected with any cinematographs at present being exhibited in Sydney. Messrs. Sestier and Barnett are at present managing the only Lumiere machine in Melbourne. Well that adds an interesting twist to things, as Sestier and Barnett started out in Sydney, moving to Melbourne on 28 October. I’ll check with Tony Martin-Jones and see what he thinks (though I am sure he wll have come across the reference too).